As my offspring steadily advances through her beginning stages of existence, I scour toy aisles with the eye of a father. Previously drooling on Technics Lego sets with motors and gears, now I fearfully eye Barbie dolls and shudder at the thought of her and her freeloading friends scattered about my living room floor. Nevertheless, I search for things that will help my spawn along her journey. Recently I happened upon Real Construction’s tool set and find I’m rather conflicted about it. The set features “real tools” which are of course plastic and an unknown, alien substance dubbed “Kid Wood.” Kid Wood looks, smells, and feels just like what we old-timers would call foam — mostly because it is foam. The teeth, and I use the term loosely, on the plastic saw are nothing more than bumps. It’s all very depressing. The box claims it’s designed for safety and makes no mess. I’m not sure what’s so great about this. The thing that makes tools cool is they aren’t toys. They can hurt you but can also do a number on wood or metal. I had my first set of small tools when I was the recommended five years of age and suffered nothing worse than crappy projects and a few bruised or cut fingers. This doesn’t seem like progress to me. Am I off base here, or do kids need to be nerfed this bad? Let us know in comments. 34 Responses to Nerfed Kiddy Tools? This is lame. 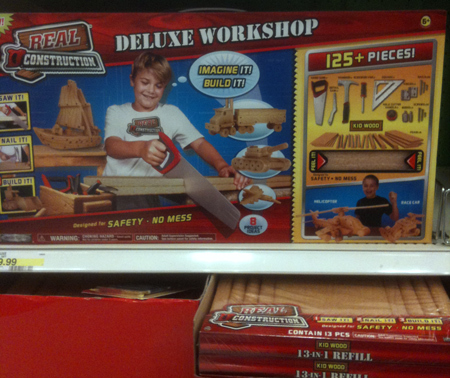 Give your kid a real hand saw and small hammer. Even if they cut themselves, it’s not like they are going to lose a finger. At least, that is what I did. So far, both kids have all 10 fingers. As a kid I had nerfed a “power tool” set that worked on a hard foam (tiny circ saw, drill press, etc) – but you could not expect to give a 6 year old a real circ saw, and the set could make great foam airplanes (I liked it). For tools we had “kiddy tools” that were capable of hurting us (never did) but not able to actually build anything. For my kids, I give them real (but cheap and small) tools that will actually work. Get her the Technics sets as well – building sets are universal. Maybe she will grow up to be an engineer! I going to have to say it depends on circumstance, if you have someplace where kids can work with real tools then this is pretty lame, if on the other hand you live in a condo or apartment, this helps put the kids on the right track with being able to build stuff early without having the end of the coffee table cut off or extra random nails in the hardwood floor. Me, I’ve wired up an extra remote e-stop for the table saw so that when mine get tall enough to use it, I have something to hover by whilst trying to look nonchalant. It’s a waste. I have an almost 2 year old. Until he’s old enough for real (but smaller) tools, I think the building stuff gene can be adequately excercised with blocks, tinker toys, and technics sets. I have a 3 y/o that I’m a bit scared to let have a real screwdriver as he will then proceed to disassemble the house 🙂 However, I’m on the lame side of this, when he’s old enough for tools, he’ll get real tools. In the meantime he has his legos and kinex to keep him busy. How ’bout a nice chaser for the stupidity that is the “Real Construction” Toolbox? I really wish I could have gone to a preschool like that! Watch this video. It is relevant. Discuss. I’ve seen pictures from Grandpa’s farm of a yard full of pre-schoolers (me, my siblings and my cousins) with real saws, real hammers, real nails and real 2X’s. Mom says we made not a single trip to the hospital for amputations, lacerations or punctures. Even a small child learns quickly that they are the only soft parts around steel tools and if you don’t like pain you keep your parts out of the way! The brain is the most important safety device around tools- learn it early and you never forget. That old man sitting on the porch taught us a lot by letting us learn. No, kids don’t need to be nerfed this bad. I’ve been using real tools with preschoolers for some time now. Children as young as 2-years-old are using hammers, saws, egg beater style hand drills, rubber mallets, and glue guns on a regular basis. We’ve even been using a few power tools like a 12 volt drill, a “mouse” sander, and even a jigsaw. We wear eye protection, of course, and emphasize the proper use of tools (real safety comes from using tools correctly). Adults are always on the scene as well. It is thrilling to watch how seriously children take on the responsibility. They do hit their thumbs (everyone hits their thumbs while learning to use hammers), they do burn themselves (everyone burns themselves while learning to use glue guns), they do pick up boo-boos, but they rarely cry because they are so focused on what they’re doing they don’t want to take the time for tears, but even when they do it ends quickly. This summer one of the boys was using a glue gun when I suddenly heard him crying. I asked, “Did you burn yourself?” He answered, while crying, “I burned myself because I wasn’t paying attention.” That’s a lesson I’m glad I got to teach him. All three of my boys started out with plastic ‘pretend’ tool sets while they were young (2-3 yrs or so). I don’t know about this foamy fake wood stuff though, sounds like a trick to get you to buy more foamy fake wood every week. 🙂 A plastic tool set and a few scraps of real wood are great starters for the lil one, especially when they’re watching and imitating dad building something in the garage. Look for power tool sets that make cool noises but don’t need too many batteries, they were a big hit too. Once your budding Bobbette Vila gets a little older you can get her a nicer, simple kid’s tool set with real tools, and let her loose on some scraps with a few nails and drywall screws. Hint: watch YOUR fingers. I noticed mine seemed to have targets painted on them during the ‘early craftsman’ days. Hammers hurt even when a 4 yr old is swinging them, and you can’t swear. I had my first real set of tools when I was 2. Real hammer, screwdrivers, and a small hacksaw. I built a bridge in preschool out of pieces of plywood and glue. I filled the bottom step full of nails when the second floor was being added. I never hurt myself more than a scratch or a bruised thumb. I had a lot of fun and learned a lot. And I took the grille off my moms car when I was 3. Tools are only as dangerous as the person using them. Teach kids early and offer them guidance and the rewards far outweigh the risks. How is a boy to loose a finger these days? Every year too many Dads spent weeks alone building a swing set or treehouse only to see it sit used after a brief fascination. What the kids really want is to be a part of the event, to help, and learn, all the while bonding with and pleasing the parent. I am so thankful that at the age of 2, I was allowed to shuffle up ladders one rung at a time handing hammers, staplers, screwdrivers, and nails to my Dad. It’s what drove my love of building things. I’ll bite on the video. I am still young and have no kids, but I completely agree that the overly safety-conscious trend is a bad one for developing kids in a way that they can interact effectively in the grown-up world. I fully intend to give my kids enough room for them to hurt themselves and learn some things. Did my parents give me a knife when I was young, yes. Did I slice my hand open trying to demonstrate how dull it was, yes. Did it heal and also teach me a lot, yes again. It’s worth it in my book to let your kid climb the trees and use the knives. If they are old enough to hold a child sized hammer, they are old enough to start learning about real tools under adult supervision. I saw this at a local store the other evening and both my wife and I thought it was lame. Work with your kids one on one with real scaled down tools. They will love it, they will learn valuable skills, and you will bond with your child. This product is designed for parents who don’t want to take the time to work with their child and really teach them something IMHO. They will get more out of working with real tools and a parent. I was given a child sized took kit when I was about 5. I actually built things I could use. You can’t sit on a foam chair built from one of these kits. Everyone has to protect everyone now a days. My Dad gave me a starter tool set when I was about 5. No real harm came from it. There are even pictures of me helping my dad build my swing set out back with my kid hammer and saw. As long as parents are there to guide and watch their kids till they get the hang of it, things are going to be fine. I wonder when someone will come out with a foam bike to protect the kiddies. Television is not a substitute for interacting with children, yet we have baby Einstein videos. Internet – Not even touching that one. The idea about plastic tools that “Can’t Hurt” children is a further advancement of the protectionist mindset of most urban parents today. Remember we have kids coming out of high school that don’t know what an adjustable wrench is and we have adults that have never handled a power drill. Well, it seems like exactly the right kind of “tool” set for kids nowadays, seeing as how they’re wrapped in two feet of styrofoam themselves so as not to endanger their precious little asses by any contact with that big, nasty, dirty, dangerous, “world” thing lurking out there. I used to have a Handy Andy tool set when I was a boy. I recently bought a set for my boys off eBay. I’m also in the I-don’t-have-kids-but-I-have-an-opinion camp. I think the little bas**rds are too coddled these days, and should have exposure to real life. Interestingly enough, my sister-in-law agrees with me. She’s really excited for her son to spend time at my place, wandering around the shop! Who’d have thought? I started giving my son his own tools when he was 5. I started with a hammer, a tape measure and some screwdrivers along with safety glasses. Our first project was a bird house that is still hanging out in the tree. He is now 7 and has a few more tools including a hand saw. He can probably already cut a board straighter than a lot of adults. He takes a lot of pride in being able to build real things with real wood and seeing him get better and learn as he gets older is one of the great joys of being a parent. I was allowed to use tools as a kid with my Dad or Grandpapa at his cottage. The most harm I ever did was with a screwdriver when I was about 5. I took apart the stairs to the basement! Fortunately someone noticed the loose treads and no one fell. This is still a funny story told in my family. I’ve turned out to be the one in the family that is the handiest in many areas. Real tools + real mistakes = real learning and curiosity. My 3 year old daughter got a plastic Black & Decker tool set from Grandma and Grandpa last Christmas. At my request, so I could quit having to get all my tools back out of her toybox. She has been allowed to add real wrenches and a rubber mallet to replace the plastic versions, and has swiped her own tape measure from me. However, she is still limited to her “special” (plastic) screwdrivers until she quits trying to take apart stuff that is still plugged in. This toy is a waste of money. When you give her real tools she should be old enough to have the self discipline to handle them safely. Then you can get her some of those stupid tools they make for women. They are smaller and should fit a childs hands better. I will say that I do like these LED spotlights. They are very light, and the batteries that are actually inside are a rechargeable set about the size of 2-3 AA’s, which is why it is very light. I know this was rated in ‘lumens’ but If I had to guess i’d say its maybe a 500,000 ‘candle watt power’ spotlight. I have a 5 million CWP spotlight that has a big 12v sealed lead acid battery in it and a car high-beam bulb as the lamp, its one serious light but the darn thing weighs about 4lb. What the hell are you talking about? I think you’re off a few posts here!!! Just part of the pussification of the world. The mama hens and lawyers have taken control. I think the issue in today’s world is that the toy manufacturers have to address the big issue among the youth of the world… That is that the parents aren’t involved with their children and keep a very loose and blind eye on them as they (parents) run about. I have become very jaded from my past experience working in retail security and loss prevention and have seen the extent of what parents will do to stay disconnected from their children. They basically find something that the kids can do alone and not bother their parent. It’s really sad. As a baseball coach and former player I can remember my parents being at all of my practices, games and trips. When I coached (20 years old) my team’s parent would use baseball as a day care and would ask for kids to be picked up and dropped off at home! My take is that this toy set is made for the non-involved parent who wants to give their kids something to do without them having to spend time with them and teach them. If you are an involved parent and believe in staying connected with your children and spending that time I say scrap this toy set and get your hands dirty with your kids and let them learn the dangers of real tools and how to practice safety and work on things without cutting off a finer! If you’re the later than I guess this is right up your alley. At the end of the day no matter how fast paced life is and how much work you have or how much you just want to kick back you need to stay in your children’s lives and help build them into productive and contributory adults… Otherwise you might just be picking them up from your local store for shoplifting! I’d just like to point out that “pussification” and “mama hens” indicate that somehow women are to blame for this change, and I need to see some evidence of that before believing it. You see fake kiddy tools as weak, useless, and worthy of disgust, and therefore equate that with femininity. What the hell? Maybe we should try to actually consider the variety of societal factors that led to kids’ tools becoming incapable of teaching the real concepts of craftsmanship. I’m worried, too, that kids who are never allowed to practice anything “real” will not be very capable adults, and that affects all of us. Heres what kids used to have in the USSR. I gave my nephew a set of smaller tools I picked out at the local big box store for his birthday. He hasn’t been able to do much with them yet but I’m hoping to help him do some work with them in the very near future. No power tools but a real saw, hammer, some measuring tools, screwdrivers, wrenches etc… Basic but usable hand tools. Funny part is the same big box store started carrying some actual kid sized tools that you can actually hurt yourse… er… build things with. Frankly, I think kids are coddled to the nth degree and that we’re likely to raise a generation of people who are completely dependent on other people to take care of them. A sad state of affairs. Step back, let your kid figure a few things out for themselves, let them do a few dangerous things, they’ll be much more useful people in the long run. This makes me sad. I have been playing with tools as far back as my memory stretches, and they’ve all been real tools, either the real deal tools or reduced-size tools because my hands weren’t that big yet. Maybe a toy welding set, like was posted a while ago would be okay, since I’m pretty sure a 4-yer-old shouldn’t be wielding a live stinger, no matter how awesome he think dad’s job is. Maybe wait until 6 or 7. But if I want my kid to know how to use say, a hammer I’m going to show him how to use a hammer. Not some nerfed plastic whackem. When you hit your thumb and it hurts, you learn not to do it again very fast. Being taught on real tools taught me to respect real tools. When I use my tools, be they metal shears or hand saws, I know what’s a bad idea and avoid ding it. I can only see the first few real-tool-years of a kid that grew up on this tool toy being loaded with ER trips and hours spend whining about how much peroxide hurts. But I’m also the kind of person that doesn’t like padded walls in asylums. Let the crazies bash their heads in and they won’t make as much noise. Am I jaded? Maybe. But really, this kind of approach is affecting the fleet’s training, so I’m becoming more and more polarized as time goes on.